Europe Between the Oceans is a wonderfully comprehensive overview of the history of humans in Europe from the time of the early settlers to the medieval period, told through the lens of geography and how it has affected the continent and its people. However, this book is not for the idle reader. It is basically a textbook (although much more engaging than the textbooks from my college days), huge and heavy (you could probably crush a cat with it), and covering an extremely wide range of topics. It does have glossy pages with many pictures and maps, which helps get you through some of the denser parts. But the information in its pages is conveyed simply and beautifully by Barry Cunliffe, one of Britain's most experienced archaeologists. This book, as the title tells us, covers the period 9000 BC through AD 1000, a staggering 10,000 years of human history. Even for a tome of nearly 500 pages, I wondered how this much history could possibly fit into a single book, and I did not envy Cunliffe his task. But from the beginning he makes it clear that his scope is broad and overarching, and that he chose not to delve into specific people or events in history, instead studying the rise and fall of human groups with a focus on geography and trade. This makes the book much simpler, with Cunliffe often describing large groups of people or cultures as a whole and looking at the differences between regions as time passed. In 500 pages he takes the reader from the end of the last Ice Age to the Mesolithic hunters of Europe, from Neolithic farmers to Bronze Age warriors, from the birth and collapse of the Greek and Roman empires to the end of the Viking Age and the rise of late medieval Europe. This journey is very broad and overarching, but Cunliffe includes enough specific examples from archaeology to highlight his points and keep the reader connected. I will say that the beginning of the book was a little boring for me, being entirely about the geography of Europe: Glaciation, rivers, wind direction, ocean salinity, natural resources...it took me a long time to get through it, though it was nicely tied together by the end of the section. But after that it became a book I could hardly put down! Cunliffe uses extensive archaeological data to explain the growth of complex societies, of agriculture and animal domestication, of early colonization, pottery, metalworking and art. He discusses megalithic structures, the evolution of language, clothing, warfare, and the rise of elitism and hierarchical societies. Of course, most of this is very brief, but it does provide a good introduction and a hefty platform to jump from if the reader wants to explore any part of it in more depth. And the pictures of artifacts and excavations are beautiful and tantalizing...In particular an in-situ skeleton covered with gold jewelry, copper axes, and hundreds of grave goods from 4000 BC...it was pretty much an archaeologist's fantasy. I would sell my soul to be able to work on a find like that! 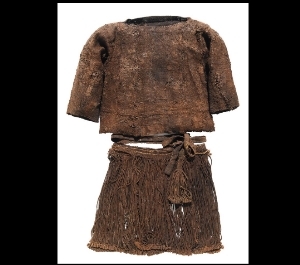 There was also a really impressive picture of a young woman's complete, preserved outfit from 1370 BC, found in Denmark, that looked almost retro-modern, and I was surprised to find it really cute. I would totally wear that...though I would probably get some odd looks walking down the street. With so many photographs of rarely-seen artifacts the past was brought very vividly to my eyes and imagination, which was a real treat. The preserved outfit belonging to the Danish 'Egtved Girl', circa 1370 BC. The only part of the book which felt a bit lacking to me was the section covering the large empires and immense civilizations such as Greece, Rome, the Phoenicians, etc. When Cunliffe was dealing with earlier times his discussions based on overarching trends felt appropriate, and with so much unknown his broad summaries were helpful and educational. But once writing began and we enter the times with so many historical documents and so many individuals and wars known to us, it felt a little like it was skimming over the surface of a deep sea. These histories are so complex and so full of characters and huge events that, in my mind, they are not best served as a brief overview of trends in population movement and economic change. In fact, the entire portion of the book in AD, so over 1000 years, is covered in only the last 100 pages of the book, which made it feel a little too simplistic. But I recognize that his scope could not include more in-depth detail of all the peoples and lands in Europe, such would be completely impossible to fit into a single book. As an overall view of Europe through this long timespan it is a highly informative and useful reference book, and I doubt anyone could have done this job as well as Barry Cunliffe. It was also very new and interesting to me to read history through Cunliffe's lens of what he calls "cognitive geography" and "political geography". I have always been more interested in history as seen through the perspective of people, and I have never really thought about it through the perspective of both the real and the imagined limits and opportunities of each region's geography. In this vein, the whole period of history dealt with in this book was driven by the themes of ocean boundaries, connectivity between people, and large-scale mobility between places. I think this provides a really interesting point of study, and one that I have never really thought of before. 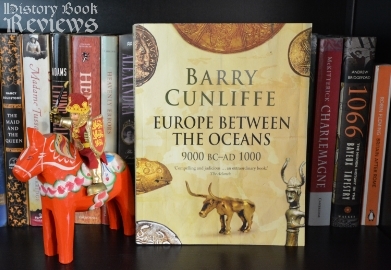 In this way, and in many others, Cunliffe's Europe Between the Oceans really broadened my perspective and gave me new eyes with which to view history, and for that I can only thank him. Thank you to my friend Keith S. from York for the great book recommendation! If you would like to recommend a book for me to review, contact me here. I always love getting new suggestions! This is my head on a drawing of what the Egtved Girl would have looked like... Just because I can.